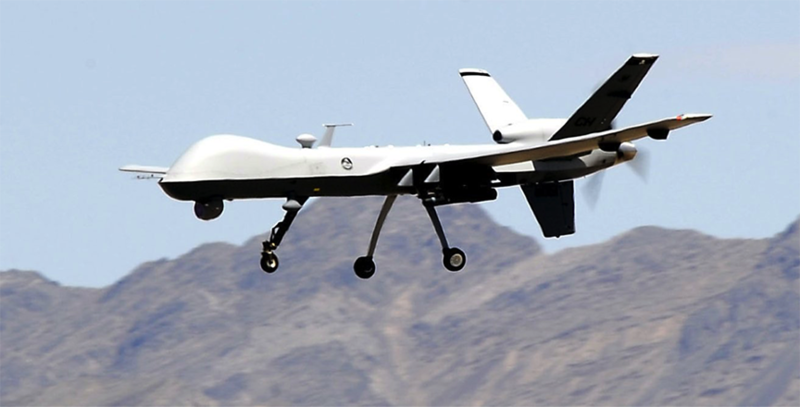 Home » Builds & Reviews » Scale MQ-9 UAV R/C Project – Cheap and Easy Vac-U-Forming! 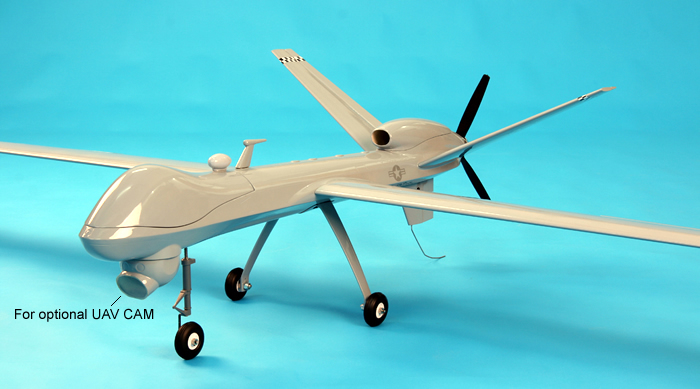 Scale MQ-9 UAV R/C Project – Cheap and Easy Vac-U-Forming! 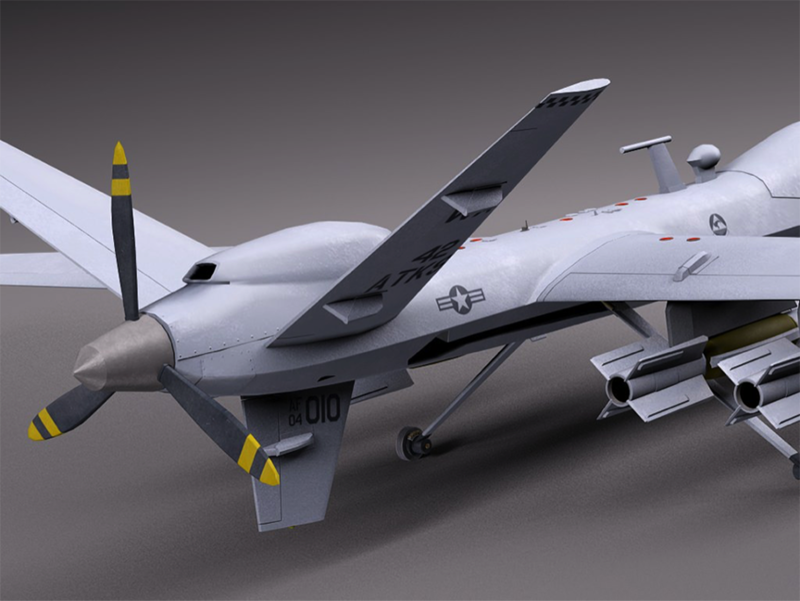 I have been working on an MQ-9 UAV (top) R/C model. It started with a Nitro Planes model kit (above). Yes, It has all of the standard Chinese good and bad that has been talked about (Ad nauseam) but it is a starting point. 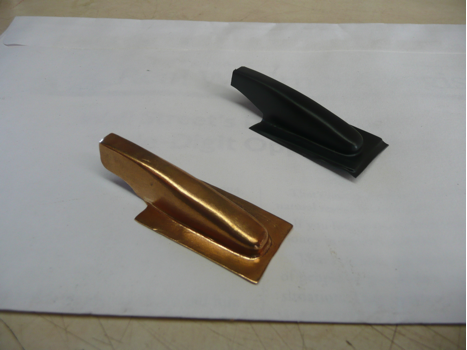 For this report though, I had to fabricate some scale pieces that had to be custom made. In this case, it is the elevator and rudder servo fairings. This aircraft has no hydraulic systems, for control actuation it is all electric servo control just like our models! Please take note as to how prominent these covers actually are. They are a visually defining bit of the overall look of this scale model. As a bit of technical information also note that there are two servo covers per elevator. This is the double redundancy of this control. There are 4 electrical elevator servos per aircraft. Note the single rudder servo ( no redundancy?). The Vee tail can, in case of a rudder servo failure, make it back to base with just the Vee tail authority. There are a lot of engineering trade-offs on this aircraft. All control surfaces are multi redundant and electrically powered. Servo covers are an important scale feature that should, in my opinion, be addressed. To that end, I vacuum formed my elevator covers in a really simple way that I found on ( where else? ) You Tube. Here is a picture of the result. I used a 10% scale 3d printed model servo cover for my 8% model because that’s what I had. This is close enough as you can see by the slightly more trimmed back plastic final result . 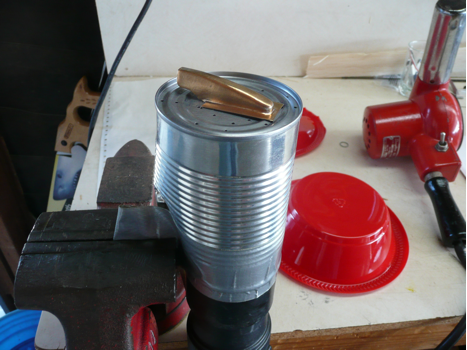 For the vacuum forming platen, I used a tin can, a shop vacuum, a heat gun, and plastic bowl that I had lying around. 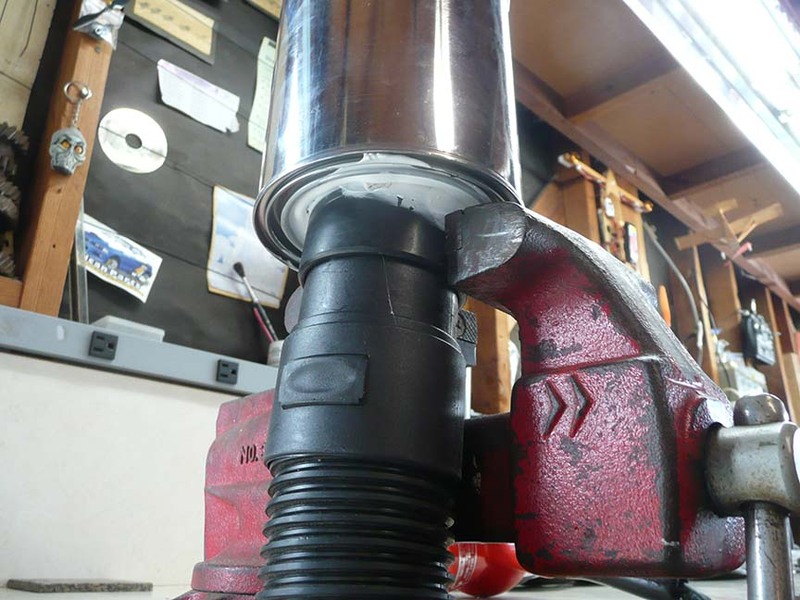 I pinched the can to fit the vacuum hose and to clamp into the vise. Duct tape took care of the air seal. 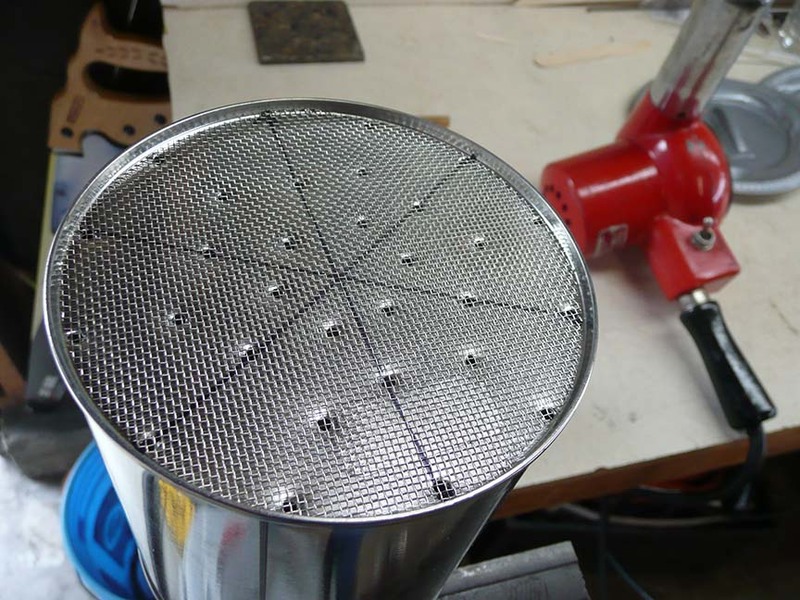 I just drilled a bunch of holes with a 1/16” drill and that is about it. Check out my really nice brass form. This is as simple as it gets. 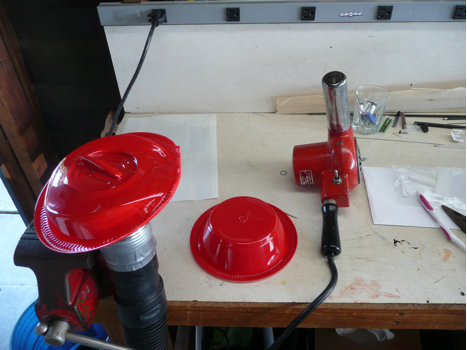 This picture shows the set up and the before and after heat-gunning the plastic bowl. 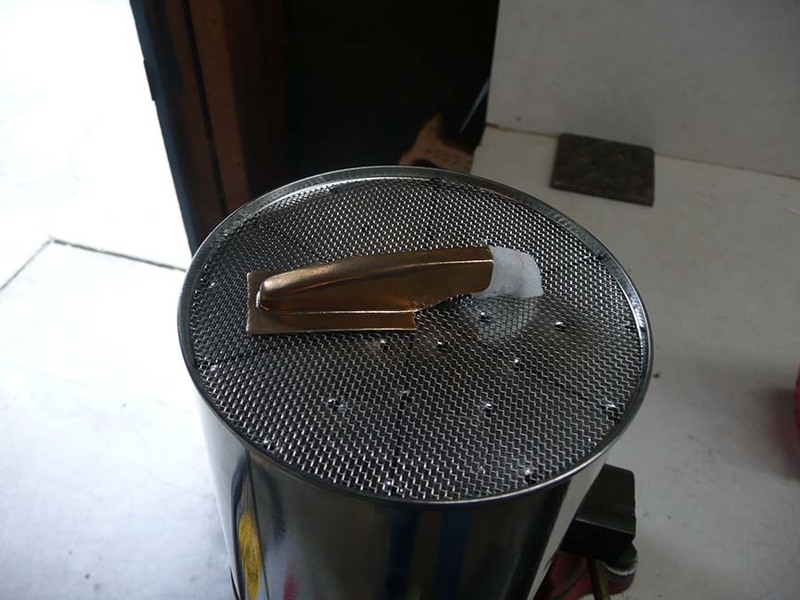 Try to keep the heat in the center of the bowl and the rim will provide a bit of a stable “frame” that help with the vacuum seal around the edge. 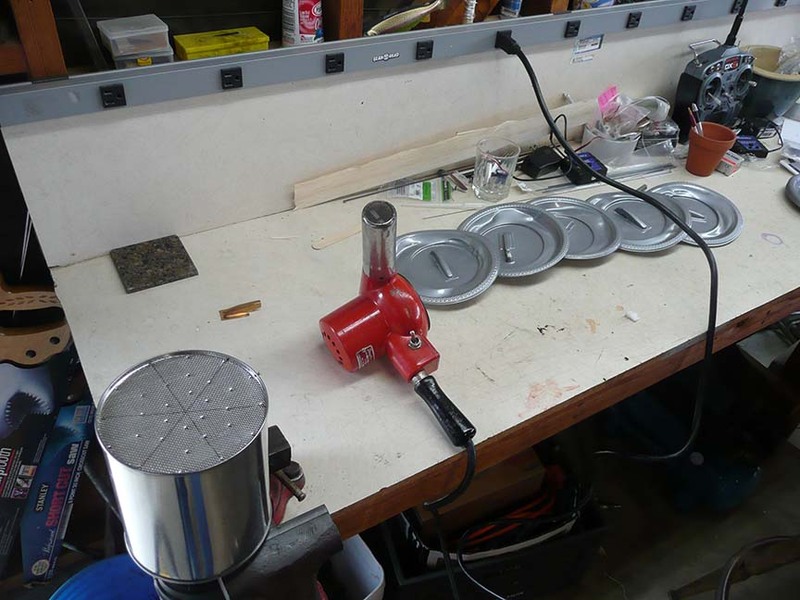 I just heated up the center of the plastic bowl and turned on the vacuum and pressed it onto the can/vacuum former. That’s it ! Be ready to scrap 50% or so until you get “ the feel for it” But, at 8 cents a try, well …. I tried a few improvements, and here are some pictures. 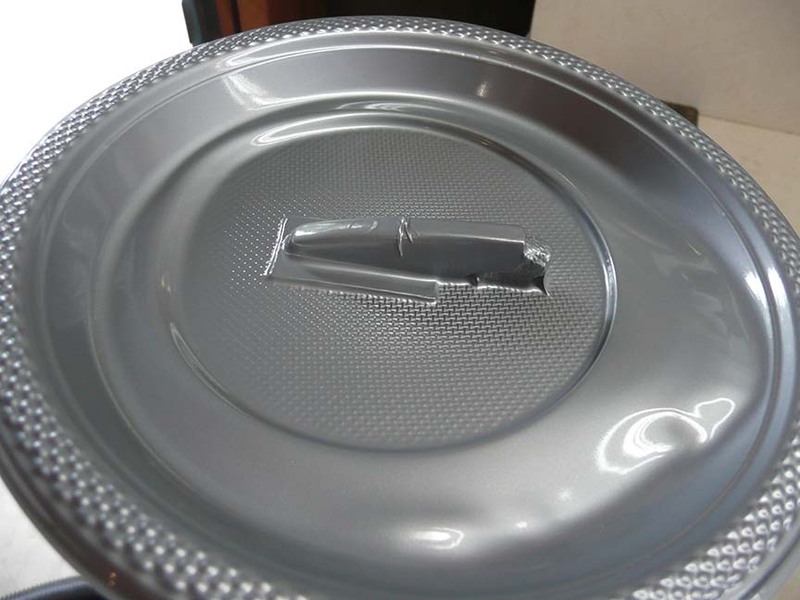 I went to party city and purchased some grey plastic plates because they are easier to paint to match. Bridge and cut itself off (and pop a vacuum leaking hole) at the back edge of the servo cover mold. 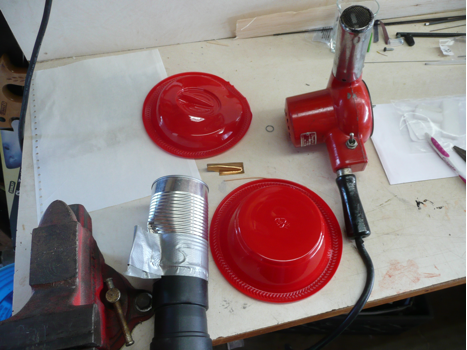 The last tip I can offer is to continue using the heat gun after applying the vacuum. You can really improve your success ratio with a little bit of well placed heat. Well, that’s about it. It’s pretty easy , cheap, LIGHT, and makes a big difference in the visual effect of a scale model. This has been a fun project, giving a new “Lease on Life” to an old airplane. The aircraft in question is a Multiplex Sonic Liner and was only available years ago. I liked the look of it then, but as I was just starting out in R.C. Flight, I knew I would crash it. Eventually Multiplex took the aircraft out of production. Bob Stinson and I think this was around 2007. I pretty much forgot about this airplane until early this year, when I was in Discount Hobby. I decided to walk back where the new boxed aircraft were to see what was there and wow, here was a Multiplex Sonic Liner. Still in the box, with a $ 46.00 price tag on it! We have all felt the rush of finding a cool aircraft that fits within our budget, but how about for $46.00? Way cool. So, box in hand, I found the store owner John and asked about this. He said a customer had it sitting around for years, unbuilt and it was missing the battery / upper hatch cover. The cheap price was reflective of the missing part which John and I both thought could be made from Home Depot styrene insulation foam. Thanks to Bob Kreutzer for sharing his latest project. With the demise of his little PT-17 this looked like a nice replacement. 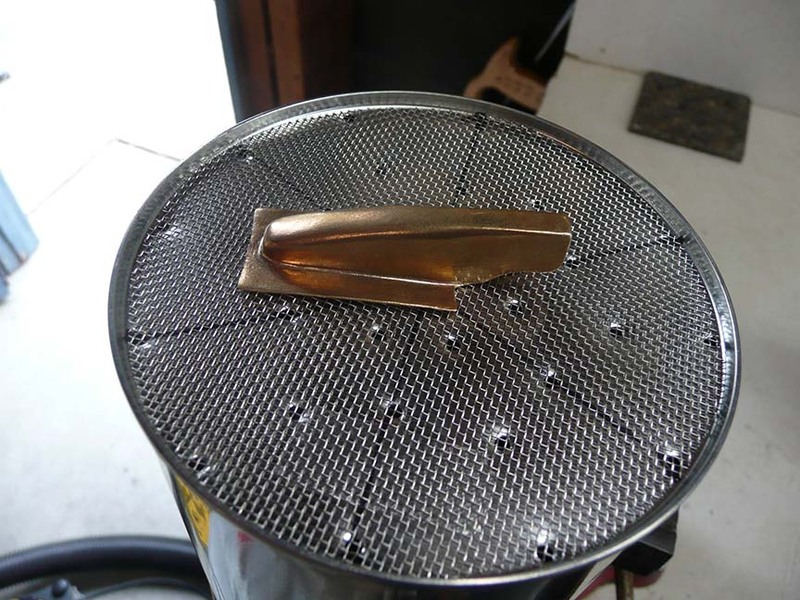 “The cowling and motor mounting was a bit time consuming , but turned out pretty nice. You may have seen this flying at the SEFSD field and wondered what it was. Is it a real plane, did it really have a third motor on the tail? The answer to both questions is yes! The plane is the Canadair CL-84 Dynavert, developed for the Canadian Armed Forces in 1964. Four were built, two still exist in museums. In an age before “fly by wire” electronics, the design was truly visionary. Top speed was 321mph, certainly faster than the helicopters of its time. However, its uniqueness and the rapid pace of helicopter development kept it from being adopted operationally. The model has two modes, hover and forward flight, both controlled by an onboard computer. In hover, the two main motors provide lift and roll control while the tail motor, which rotates left and right, provides pitch and yaw control. Stability in transition to forward flight is handled by the computer. A big servo in the fuselage pivots the wing. In forward flight, the tail motor shuts down and control is by standard elevator, ailerons and rudder. The real plane did not tilt the tail motor, but achieved hover control via variable pitch propellers, and flaps and ailerons in the main propwash. The Dynavert model sometimes gets mistaken for a V-22 Osprey, but the Dynavert preceded the Osprey by 40 years. One main difference is the CL-84 tilted the whole wing, while the Osprey only tilts the motor nacelles. This latter is a distinct advantage, as when the Dynavert wing is vertical it makes a great air dam! If the model is flown in a breeze, it sometimes has to tilt close to 45 degrees simply to keep stationary. An example of the real one is on display at the Canada Aviation Museum in Ottowa.